Sanpoil Autumn and trip to Washington D.C. This is my first studio painting of the year. It's been raining and cold every day. We sure need it, the ground soaks it right up. It hasn't rained for months and months. There is snow in the mountains and the Indians are burning slash, creating a nice but pungent haze in the valley. When the sun does shine the mountain shadows are every shade of ultramarine blue. 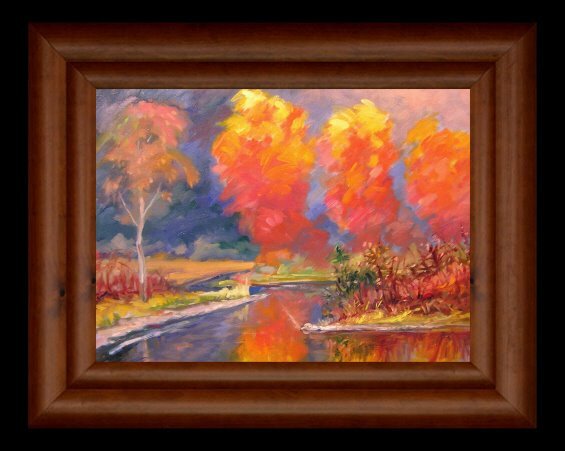 Perfect to set off the brilliant oranges and reds of cottonwoods and aspen. I chose to work from my studies. I still had the same paint on my pallet that I had been using so thought it would be logical to use those colors and the notes from some landscapes. I had fun developing some of the color combinations I had discovered outside i.e. intense gradations of Hansa + white for highlights down yellow cad, virmillion and alizarin mixing alizarin and ultramarine with white to get some wonderful pastels. In this painting I used the "Golden Rule" idea for the composition with the center of interest in the middle of the painting perhaps too much so but it does feel like I achieved the intent. I look forward to perhaps a series of these to develop the idea and see where I can take it. I listen to classical music and don't notice the day go by as I paint away! I worked outside everyday with the intention of working indoors during the winter. I started just fixing up some plein air work, adjusting and altering right on the existing painting but quit after I realized they were important notes that I can't afford to lose. I have lots of digital photographs but they aren't to helpful. They help with the mechanics of things such as composition and object identification but lack any kind of ability to inspire interpretation. I've come to the conclusion that nature is a point of departure. If I thought I wanted a perfect picture of reality I would take a photo but they don't even come close to the right colors. Paintings are about Ideas whether it was the cave man, Monet or Picasso the end result was a reflection of the artists thoughts or ideas. I had the opportunity to go to the Freer Gallery where many Whistler masterpieces reside. I also got through Hirshorn Museum of Modern Art but felt those represented were large "smart asses" thumbing their nose at the viewer but I also recognized that they were those that pushed the envelope of convention. I particularly liked the installations and sculpture especially the most modern sculptures such as David Smith's welded sculpture of a Raven. I came to wonder why I can stand in front of a Church, Moran, or Bierstadt for hours and marvel at their accomplishments. As usual I spent most of my time in the National Gallery of Art looking at those favorites but discovered two wonderful paintings by George Bellows of his famous "Boxers". Huge dark canvases such as Rembrandt would have devised with two figures brutally locked in combat under a light from above, a rabid crowd dark on dark crowded around the bottom of the combatants. I was delighted to see two of his cityscapes. Truly a virtuoso painter. Much pallett knife work but very acurate fooling the eye in such a way that the shapes come together from a distance of about 10 feet. Fun stuff! I have to think that his process was such that after working on location he would distill his thoughts and visual memory into such wonderful work. The Freer Gallery built at the behest of Railroad tycoon and art Patron (William?) Freer has many of the "Aestetes" such as Whistler, Dwyer and Twachtman. I didn't know that Whistler was so influetial on art history. He changed how art was viewed in his time by making a painting, 'art for arts' sake', a saying I have often heard but hadn't realized that there was an actual transition from allegorical paintings that told a story to what we take for granted today as the artists license to do his own thing. He also interjected "Harmony" into his paintings from observing Oriental art. The painting became an object in his own right. One of the most significant personal insights I got from observing Whistlers work some as small as my hand, was painting or rather drawing over an underpainting with thin washes in such a way as to allow the brushstrokes to appear transparent and delineate the lines of the form as you would with a pencil. The transparent veils of a woman's dress or japanese paper parasol achieving a translucent quality. He often painted on wood panels with thin washes over an underpainting. I hope I can remember to try the technique. I have to mention why I was back in D.C. of all places for a horselogger/artist. As Secretary of the WPUDA we had to try to convince our NW delegation of the critical need to dissuade BPA from proceeding with deregulating our transmission system in the NW. Apparently we were successful as when we came back Steve Wright of BPA pulled out of the discussions which effectively kills the process although I won't be surprised if another 'for sale' sign gets hung on some feature of our federal energy resources. Stay Tuned!